Long-term care (LTC) insurance can be a good way to protect your assets and your family from the high costs of care associated with getting older. But like with other types of insurance, carriers tend to deny the claim first and ask questions later. This can lead to an unexpected cash crunch - in addition to stress at an already difficult time. Instead of facing the journey alone, it’s prudent to seek the services of an experienced attorney to prepare the initial claim for long-term care benefits. By doing so, you can take steps to avoid a denial. However, if you do receive a denial of coverage and are facing an appeal, hiring the right attorney is critical. The Long-term care claims and appeals attorneys at Genser Cona Elder Law offer more than 20 years of experience helping seniors throughout New York receive the claims and coverage they deserve. Long-term care policies are designed to cover or defray the cost of home care, assisted living, nursing home care and other care needs. Long-term care can be especially helpful when your or a loved one requires assistance with activities of daily living, such as bathing, dressing, grooming, eating, using the bathroom, and assistance with mobility. The concept of long-term care insurance is much like any other insurance: the beneficiary files a claim to receive benefits under the policy when there is a qualifying event. However, the reality of getting a claim paid is often quite frustrating, as LTC insurers frequently engage in delay tactics or deny otherwise valid claims for reasons ranging from self-serving interpretation of policy language to reliance upon biased doctors or nurses to justify the denial. Whether through delay or outright denial, LTC insurers often bank on a claimant’s frustration. Unfortunately, many claimants do give up, allowing the LTC insurance carrier to collect years and years of premiums without paying out for rightful and legitimate claims. We'll use our decades of experience dealing with insurance carriers and interpreting medical records to help guide you through this often complex and daunting process. Many wrongful denials may be overturned without resort to litigation. A carefully and properly prepared claim or appeal by Genser Cona Elder Law’s experienced attorneys is one of the best ways to ensure you receive your benefits. Why Do Insurance Companies Deny LTC Claims? Your long-term care policy is a contract between your insurance company and you. They are contractually obligated to cover particular expenses as long as you meet the conditions and terms explained in the policy’s fine print. Unfortunately, this “fine print” is often very confusing and difficult to understand. Limitations on the types of coverage you may eligible for. In either case, requesting coverage or reimbursement for your claim can be frustrating, difficult and time consuming. Far too often, those who need LTC insurance benefits do not have the wherewithal to fight with the company, which is where we come in. The attorneys at Genser Cona Elder Law will fight for your rights and help you get the benefits you deserve. If your LTC claim has been denied, your insurance has the obligation to provide the exact basis for the denial, which is typically disclosed in a denial letter. Once you know the basis for the denial, you may be able to provide additional information to support your claim. Make sure you pay attention to the amount of time you must appeal the denial, which is listed in the policy. Once you have exhausted all of your appeals and the insurer continues to deny benefits, you have the right to file a lawsuit against the company for breach of the long-term insurance contract. At Genser Cona Elder Law, we utilize a range of strategies to help our clients effectively deal with denials. In most instances, we’ll work to resolve the issue prior to exhausting your denials. However, we are prepared to battle for your rights and take your claim to court if necessary. When it comes to your long-term care insurance, you do not have to simply accept a denial of coverage. The New York Long-term care insurance attorneys at Genser Cona Elder Law will fight for your rights and your benefits. We bring more than 20 years of experience helping residents throughout New York win long-term care insurance denials and appeals. Our unwavering commitment and in-depth knowledge of the long-term care insurance process allows us to prepare your claim properly and challenge any denial of benefits. Contact Genser Cona Elder Law today for experienced long-term care claims and appeals assistance. 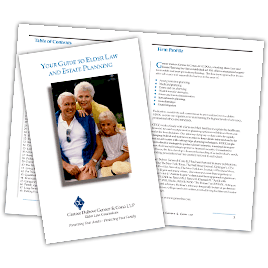 This guide busts the top 10 myths of Elder Law & Estate Planning, and teaches you the right answers.